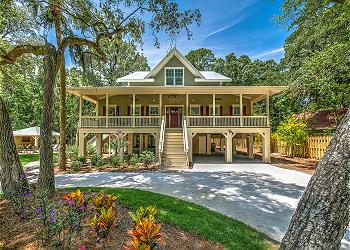 Beach-cottage style at its beautiful brand new best! Picture-perfect coastal chic, this 3rd row ocean home is just 30 yards away from the beach with ocean views from the large king suite with private patio and en-suite bathroom. You’ll lack for nothing at this island retreat with its 6 bedrooms, 5 1/2 bathrooms. Endless amenities include elevator, large open floor plan with dining and living area with fireplace, large chef’s kitchen with an island that seats 12, outside living space with covered outdoor eating area, hot tub and *heated pool, Ping Pong, pool bathroom an outdoor shower and more. Did we mention there’s a flat panel TV in every bedroom–although we think you’ll be spending most of your time on the beach and exploring the island. • *Heated Pool (12 x 24) *This pool has an electric heat pump. The pool can be heated for an additional fee of $300 + tax per week. • *Pool can be heated at an additional charge. This pool has an electric pump and can be heated for $300 + tax per week. The hot tub is heated for FREE. • This property does not have a land line. • The Vacation Company App will contain all of your check-in information (keyless door code, Wi-Fi Codes, and other information pertinent to your stay).